Agrinostics Ltd. Co. has provided specialty testing products and services for pasture, turf, cereals and grass seeds since 1997. We work closely with international and national seed testing associations to assure our testing products meet their stringent standards for consistent and reproducible results in standardized tests. 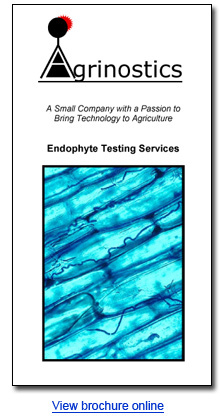 Whether you are testing seeds for endophytes, pathogens, and/or their toxins, we are dedicated to providing the best suitable methods for routine analyses. Our services include contract and piece work for companies, agencies, or individuals. Our personnel maintain memberships to professional societies related to seed testing, crop and animal production, turfgrass industry, and veterinary societies to keep abreast on issues pertinent to our plant, animal, and aesthetic industries, and society's concerns. Who uses our products and services? Agrinostics Ltd. Co. is dedicated to providing our customers with diagnostic tests for crop pathogens and toxins that are threatening to our quality food supply. Our mission consists of three inter-related components. Product: Produce and sell the finest quality and innovative testing protocols for individuals interested in increasing the value of their farm or food products by testing and eliminating pathogens and toxins threatening the food supply and/or animal health. Economic: Operate a company dedicated to sound financial principles that result in profitability and career opportunities for our employees and their families. Social: Recognize our responsibility as a community leader by providing time and resources to schools and organizations promoting education, personal development, and sound citizenship responsibilities.